On icy mornings, it is hard to believe that spring is only around the corner. Fortunately, the long nights are starting to draw in, and the signs of the season to come will soon start to appear. Some of the first flowers have already started to bloom; snowdrop and daffodil are a welcome sight after a long, dark winter! As March progresses, we will start to see primrose, and the first buds on the blackthorn bushes. For me, the most exciting sign of the changing season is the growing birdsong. Over the coming weeks, the dawn chorus will begin to grow in its complexity and volume as breeding birds from home and overseas, pile in to establish their summer breeding territories. As part of my role on the Beyond our Bridges project, it is my responsibility to record this influx and activity. So, at this time of year, I am just about ready to start my summer recording! Over the past 3 years, a wide range of species have been recorded across our sites. Striking the correct balance in the ways that we manage our habitats is key to this diversity. 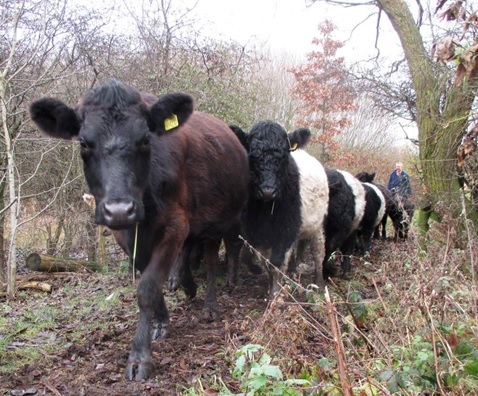 However, one technique, and a set of especially committed workers deserves a special mention; no less, these are our grazing Longhorn and Belted Galloway cattle. Grazing cattle has long been documented as a traditional way to increase bird life on saltmarshes, specifically, ground nesting waders such as lapwing and redshank, and singing species such as skylark. Last year, was our first full summer of grazing, and with it we had a great result. In total, three lapwing breeding territories were recorded, and numerous other wading species were using the site that we hadn’t had records of in the previous two years of records. This is exactly what we had hoped to see, and my fingers are crossed that we see something similar in 2018. Lapwing will start to set up their summer territories from as early as March. During this month, we may even be lucky enough to catch the odd chiffchaff, or willow warbler song as they arrive from the Mediterranean wintering grounds. So for these birds, spring is practically here! On a fine February day, I arrived at Upper Moss Side Farm to conduct my monthly survey. Very easily I could have been convinced that this was an April morning, and the birdlife seemed to agree. At once I was greeted by “…a little bit of bread and no cheese…”. This is the most distinctive rhythm of the singing yellowhammer, a bird that has been in widespread decline throughout the UK, a decline that has been echoed at our local sites. So, a nice start! Continuing the survey, I noted reed bunting, several song thrushes, and a skylark, all in full song. However, the big find came at the end of the visit. The decline in the populations of farmland bird species is now well known. This includes species such as the yellowhammer and corn bunting. One species in particular has had a noted absence from the Upper Moss Side area, and that is the tree sparrow. The last records for the area are from 2002, and 2006, so it was a great surprise to me to spot twelve, at once feeding on stubble fields! The birds were in close with flocks of brambling, which were also using the fields to feed. These records have been submitted to the local records centre; let us hope that this is the beginning of a new presence for the tree sparrow in this area! There will be more information on this great news coming soon, so be sure to keep an eye on our website news page and social media!